Director Ford with his two principal stars on set. 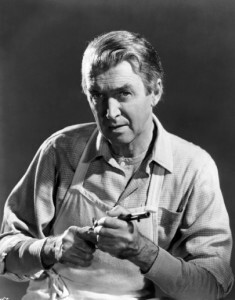 Senator Ransom Stoddard (James Stewart) and his wife Hallie (Vera Miles) return to Shinbone, the western town where he initially made his reputation decades earlier. As matters slowly develop, they are there for the funeral of an old friend, Tom Doniphan (John Wayne). And the movie goes into an extended flashback, to when Stoddard initially arrived, only to be robbed and badly beaten by a band of stage robbers. The gang is led by the Liberty Valance of the title, so there is no suspense on the fate that awaits Valance in the course of the film. 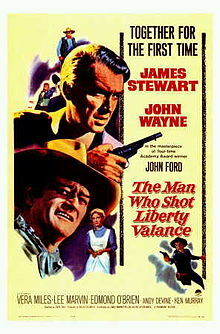 The remaining question is who will take care of Valance, since the younger Stoddard doesn’t really seem up to the task. Stoddard represents the forces of civilization that, as we all know, will ultimately be successful in taming even the West, although the question is in doubt in Shinbone at the start of the movie. The traditional tools of civilization, law and courts, seem powerless to deal with the brutal, relentless violence of Liberty Valance. The badly beaten Stoddard is brought to town by Doniphan and his hired hand/servant Pompey (Woody Strode), and given to the care of a family of Swedish immigrants who run a restaurant. Their daughter is Doniphan’s girlfriend, although he seems slow to do anything to move the relationship along. Doniphan is comfortable and capable in the west in a way that easterner Stoddard is not. Having been robbed, Stoddard earns his keep washing dishes in the restaurant, and he starts a school for adults and children and hangs out his shingle at the office of the newspaper (the Shinbone Star) run by Dutton Peabody (Edmund O’Brien). It’s clear that there will have to be a reckoning with Valance, described by Doniphan as “the toughest man south of the Picketwire, except for me.” (Use of the name of the Picketwire [or Purgatoire] River would seem to place this in southeastern Colorado Territory. And the talk of impending statehood would put it before 1876, when the Centennial State joined the Union.) We look forward to seeing Doniphan and Valance shoot it out. But Stoddard won’t leave town, despite his demonstrated ineptitude with a gun, and, worse, his determination not to use violence but the largely ineffective tools of the law. That Insistence on staying in Shinbone results in a shootout that leaves Valance dead and makes Stoddard’s reputation. But in the wrangling over statehood that follows, Stoddard learns that events the night of the shootout were not quite what they seemed, even to him as a participant. His own career takes off; he marries Hallie and becomes governor and then senator; Tom Doniphan, who seemed much better suited to life in the west at the start of the movie, goes in a different direction–downhill. The central conflict in this movie is among three, not two, characters: Valance obviously shouldn’t and doesn’t win; the realist Doniphan deserves to win but doesn’t, entirely. Stoddard, the face of American populist idealism, comes out on top, as we know from the beginning of the movie. There’s a fair amount of Capra-esque Grapes-of-Wrath-style frontier populism in this movie, which wouldn’t be palatable without a strong underlying story, excellent main characters and the violence of the confrontations with Valance. This populist quality is emphasized by the presence of Stewart from Mr. Smith Goes to Washington. The faith in the common man as citizen and voter and the 1940s New Deal-ish black-and-white politics seem naïve now, and maybe they were even in the early 1960s. It all seems simplistic, with undue reverence for freedom of the press even when that press is in the hands of an alcoholic editor, the scenery-chewing Dutton Peabody (Edmond O’Brien)—a character very reminiscent of the alcoholic Doc Boone, played by Thomas Mitchell in Stagecoach more than twenty years earlier. Stoddard contemplates the non-legal way. Speaking of black and white, it was an interesting choice to film the movie that way in 1962 when color movies had taken over pretty thoroughly. Half a decade earlier, even the relatively low-budget Boetticher-Scott westerns had been filmed in color, and Ford had been using it since the late 1940s. It adds to the retro feel—not back to the open west, exactly, but to the 1940s. Ford still has his visual style with a western, although this one is not set in Monument Valley. It’s shot largely on a studio back lot at Paramount. The opening stage robbery and beating takes place on an obvious sound stage, but other times there is great use of expansive western vistas, even with medium shots. A twist at the end of the movie seems similar in many ways to the ending of an earlier John Ford movie, Fort Apache. In both, the film ends with the main character (Stewart here, Wayne in Fort Apache) affirming or allowing his support for an erroneous public version of a major historical event, when he knows the truth is different. As Stoddard recounts the actual truth of long-past events to the current editor of the Shinbone Star, he asks in surprise, “You’re not going to use the story, Mr. Scott?” Scott replies with the signature line for this movie, and perhaps for many other Ford westerns: “No, sir. This is the West, sir. When the legend becomes fact, print the legend.” By this, director Ford seems to be encouraging a skepticism toward conventional history. The closing paradoxes and strongly-developed characters give this film its lasting impact. 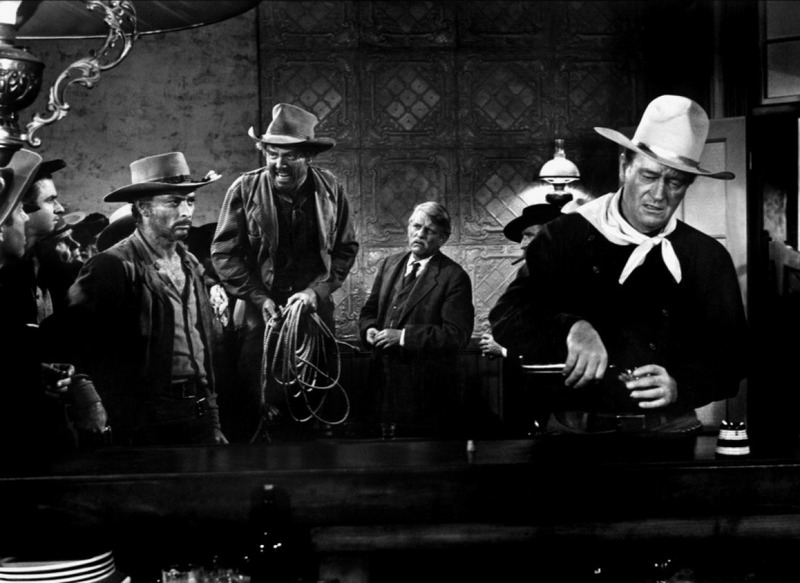 John Wayne is at his best, even with his continual use of the word “pilgrim”—more than in any other movie he made. He smokes frequently on screen, ironic when we know that John Wayne will be dead within two more decades from lung cancer. In one shot, his exhaled cloud of smoke is used to dissolve to a past scene, a technique that seemed old-fashioned even in 1962. Stewart is good with his character’s ups and downs, although he sometimes seems a little too hysterical and his halting Stewart-ish mannerisms, especially in speech, can be slightly annoying. Wayne and Stewart are a little old for the age their characters are supposed to be for most of the movie, and Stewart plays much older than he actually is for the framing story. O’Brien is over the top as the loquacious newspaper editor, and we see too much of Andy Devine as the ineffectual but supposedly loveable town marshal Link Appleyard; he’s supposed to be the comic relief. Vera Miles is lovely and plays well in her minor part. 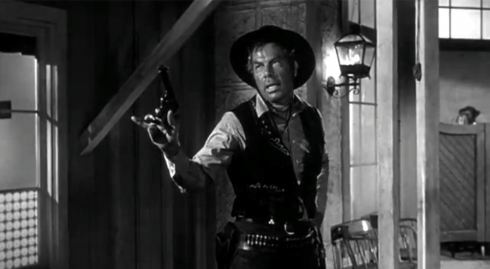 This movie has an all-star cast of villains, too: Lee Marvin is at his nastiest and most brutish as Liberty Valance, supported by the weaselly and perhaps mentally unstable Floyd (Strother Martin) and that personification of slit-eyed menace, Lee Van Cleef, as Reese. Valance’s sheer evil, with him always seemingly on the edge of losing control, and a psychotic tendency to try to kill people with his silver-handled whip, make this trio of evildoers more intimidating than their modest numbers would suggest. 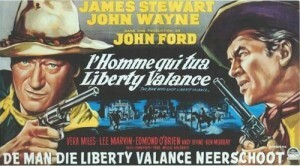 Belgian poster for Liberty Valance, with pictures of Wayne and Stewart clearly taken from other movies. The title song, written by Burt Bacharach and Hal David and sung by Gene Pitney, was a hit in the early 1960s, although the hit version does not appear in the film. Apparently Gene Pitney was not asked to record it until after the film was released. However, it ranks with Tex Ritter’s “Do Not Forsake Me” in High Noon and Johnny Horton’s theme for North to Alaska. They’re among the very best western film theme songs with actual singers. 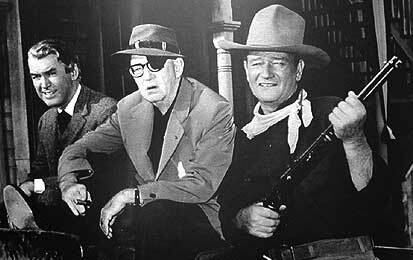 Liberty Valance is John Ford’s last great western, although Ford continued making movies. It’s a good bookend for the second half of his career, since there are three actors in this who appeared in Stagecoach, the movie that kicked off that career segment: John Wayne, obviously, Andy Devine and John Carradine (as anti-statehood orator Cassius Starbuckle)—all of them Ford favorites. 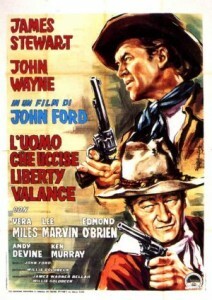 This was Wayne’s last film with Ford, although Stewart shows up again as a too-old Wyatt Earp in a strange lnterlude in Ford’s Cheyenne Autumn a couple of years later. This entry was posted in 55 Greatest Westerns and tagged James Stewart, John Ford, John Wayne, Lee Marvin, Town Taming, Woody Strode on September 5, 2013 by Nicholas Chennault.